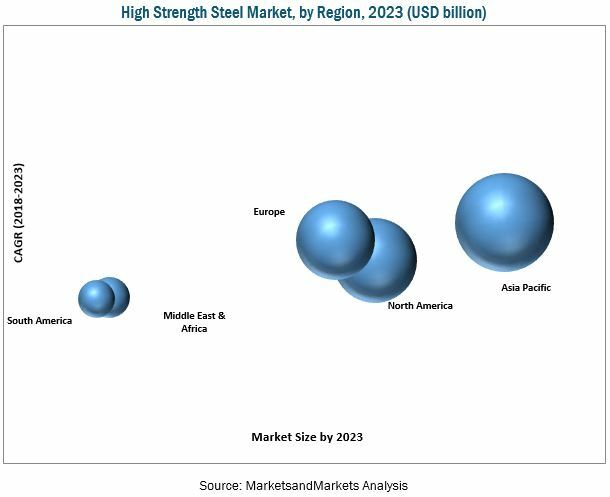 [177 Pages Report] high strength steel market was valued at USD 25.23 billion in 2017 and is projected to reach USD 40.85 billion by 2023, at a CAGR of 8.4% between 2018 and 2023. For company profiles, 2017 was considered the base year. In cases, wherein information was unavailable for the base year, the years prior to it were considered. The ecosystem of the high strength steel market includes manufacturers of high strength steels and its products such as Voestalpine AG (Austria), POSCO Group (South Korea), ArcelorMittal S.A. (Luxembourg), SSAB AB (Sweden), Nippon Steel & Sumitomo Metal Corporation (Japan), Tata Steel (India), Steel Authority of India Limited (India), United States Steel Corporation (US), Baosteel Group Corporation (China), Severstal JSC (Russia), ThyssenKrupp AG (Germany), JFE Steel Corporation (Japan), Nucor Corporation (US), and JSW Steel (India), among others. Scope of the Report: This research report categorizes the high strength steel market based on type, end-use industry, and region. The report forecasts revenues as well as analyzes the trends in each of these submarkets. The high strength steel market is projected to grow from USD 27.32 billion in 2018 to USD 40.85 billion by 2023, at a CAGR of 8.4% between 2018 and 2023. Increasing demand for high strength steels from various end-use industries such as automotive, construction, yellow goods & mining equipment, and aviation & marine, among others, is driving the growth of the high strength steel market across the globe. Among types, the high strength low alloy segment of the high strength steel market is projected to grow at the highest CAGR during the forecast period. High strength low alloy steels are low carbon steels, which contain up to 10% of alloying elements. These low levels of alloying elements allow easy tempering and quenching of high strength low alloy steels so that high levels of impact toughness and strength can be obtained. High strength low alloy steels are widely used in the automotive industry. The growing automotive industry across the globe due to continuously increasing population is expected to drive the growth of the high strength low alloy type segment of the high strength steel market during the forecast period. Among end-use industries, the automotive segment is expected to lead the high strength steel market in 2018. The use of high strength steels for manufacturing body panels of automobiles increases their fuel efficiency by reducing their weight by approximately 60%. In comparison to conventional steels, high strength steels not only enable weight reduction of products but also provide them high impact strength. Therefore, automotive manufacturers across the globe are resorting to high strength steels for manufacturing their vehicles. This, in turn, is expected to lead to the growth of the automotive end-use industry segment of the high strength steel market during the forecast period. The Asia Pacific region is the largest consumer of high strength steels across the globe. The Asia Pacific high strength steel market is also projected to grow at the highest CAGR during the forecast period. The growth of the Asia Pacific high strength steel market can be attributed to the increased demand for high strength steels from emerging economies such as China and India. Moreover, technological advancements in the automotive and construction industries of countries such as China, Japan, South Korea, and Taiwan, among others have also resulted in an increased turnaround in the consumption of high strength steels in these countries. High production costs of high strength steels due to increased prices of raw materials are expected to hinder the growth of the high strength steel market during the forecast period. Key companies operating in the high strength steel market include Voestalpine AG (Austria), POSCO Group (South Korea), ArcelorMittal S.A. (Luxembourg), SSAB AB (Sweden), Nippon Steel & Sumitomo Metal Corporation (Japan), Tata Steel (India), Steel Authority of India Limited (India), United States Steel Corporation (US), Baosteel Group Corporation (China), Severstal JSC (Russia), ThyssenKrupp AG (Germany), JFE Steel Corporation (Japan), Nucor Corporation (US), and JSW Steel (India), among others. These leading players have a wide market reach and established distribution networks, and are investing increasingly in R&D activities to develop new grades of high strength steels. These companies also have strong technical capabilities, which enable them to upgrade their existing products for new applications. 10.12.1 Hebei Puyong Iron and Steel Group Co., Ltd.
10.12.2 Jiangsu Shagang International Trade Co., Ltd.